A bridge over the river Siene is decorated with messages of love. 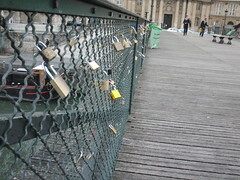 On the barrel of each padlock is a message of love, some in black pen, some in red varnish. Beautiful art emerging in one place, bought by so many lovers. This scribble was published on Saturday, September 11th, 2010. You can follow any banter on this scribble with the RSS 2.0 feed. You can leave a response, or trackback from your own site.